Police have searched the Las Vegas home and offices of Michael Jackson's doctor as part of a manslaughter investigation into the singer's death. 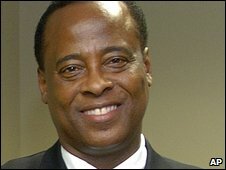 Dr Conrad Murray's lawyer, Edward Chernoff, said officials were looking for the star's medical records. The search is the second in a week following a similar operation at the doctor's Houston clinic on 22 July. Dr Murray, who was with Jackson and tried to revive him before he died, has not been named as a suspect. In a statement, Dr Murray's lawyer Edward Chernoff said the warrant "authorised investigators to look for medical records relating to Michael Jackson and all of his reported aliases". He added Dr Murray was present during the search of his home and assisted the officers, who seized mobile phones and a computer hard drive. Reports suggest the investigation around Jackson's death is focusing on his use of powerful painkilling drugs. The Drug Enforcement Administration has been involved in the investigation because the agency licenses doctors to administer controlled pharmaceuticals. Searches at the clinic and another site rented by Dr Murray in Houston, Texas, were carried out last Wednesday after a warrant was issued by a judge in the city. The warrant, filed in Harris County District Court, said authorities were looking for "items constituting evidence of the offence of manslaughter that tend to show that Dr Conrad Murray committed the said criminal offence". Such charges against a doctor for the death of a patient are extremely rare and require authorities to show there was a reckless action that created a risk of death. Items seized during the searches included 27 tablets of the weight loss drug Phentermine, a tablet of the muscle relaxant Clonazepam, two hard drives, notices from the Internal Revenue Service and a registration for controlled substances. Police have said Dr Murray is co-operating in the investigation. Paramedics were called to Jackson's Los Angeles mansion while Dr Murray was performing CPR on the singer on the day he died, according to a recording of a 911 call. Speaking a few days after Jackson's 25 June death, Mr Chernoff, denied his client administered painkilling drugs that could have contributed to the singer's death. An official determination of what killed Jackson will not be made until the results of a toxicology report are disclosed.